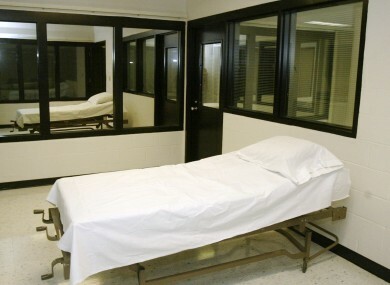 The death chamber at the Missouri Correctional Center. ASSOCIATED PRESS, the Guardian and three Missouri newspapers have filed a lawsuit challenging the secret way in which Missouri obtains the drugs it uses in lethal injections, arguing the state’s actions prohibit public oversight of the death penalty. “We assert that there is a constitutional right for the public to know the drugs that are used when a state puts someone to death,” said Dave Schulz, an attorney for the news organisations and co-director of the Media Freedom and Information Access Clinic at Yale Law School. A spokeswoman for Missouri Attorney General Chris Koster, Nanci Gonder, declined to comment when asked Thursday about the lawsuit. Missouri law prohibits naming anyone who is part of the “execution team.” The Missouri Department of Corrections considers the drug provider part of that team. The lawsuit was filed in Cole County Circuit Court in Jefferson City by the AP; Guardian US, The Kansas City Star, the St. Louis Post-Dispatch and the Springfield News-Leader. Email “News organisations take Missouri to court over lethal injection policy ”. Feedback on “News organisations take Missouri to court over lethal injection policy ”.